It is a highly charged time in South Africa, and truly a miracle that this election has even come to pass. Thousands of people have been killed since Mandela’s release from prison–most during violent clashes between black South Africans, as supporters of the African National Congress (ANC) and the Inkatha Freedom Party (IFP) have battled for power. The white minority Afrikaner party has also played a large part in this deadly equation. On the first day of Jeffrey’s arrival in Johannesburg he experiences the horrors of this power struggle firsthand, as a car bomb explodes near him. It is a last-ditch effort by Afrikaner radicals to try to scare blacks away from the voting booths, hoping to prevent the end of white minority rule. Lives are destroyed and nerves shattered from the blast, but nothing can prevent the tidal surge for equality already in motion. Voting takes place over three days with lines snaking for miles as blacks queue up to vote for the first time in their lives. Many wait in the blistering sun for an entire day to cast their ballot. At first Jeffrey is eyed with distain as he photographs voters in Soweto, a township representing decades of oppression, but after explaining that he has come all the way from American to photograph what he imagines to be one of the best days of their lives, he is soon wrapped in acceptance. As early election results begin confirming what most had hoped and assumed, Mandela far in the lead, euphoria sweeps through the streets of Johannesburg. When De Klerk finally calls Mandela to officially concede defeat, celebrations erupt throughout the city and country. Goosebumps rise on Jeffrey’s arms as he absorbs the moment, imagining the bittersweet emotions Martin Luther King Jr. would have felt had he still been alive to witness it. It isn’t until a week later that Mandela’s inauguration finally takes place in the country’s capital, Pretoria. May 10, 1994 is like no day Jeffrey can ever remember. He has photographed presidential elections in several countries, but this election is much more: this is the birth of a new nation. Mandela’s inauguration brings together the largest number of Heads of State since the funeral of President John F. Kennedy in 1963. For one single day kings, queens, presidents, prime ministers, and dictators all put aside their political differences and come to honor a man being bestowed the enormous responsibilities of leading a new South Africa into the new century. The political prisoner-turned-president has won an overwhelming mandate and everyone wants to be part of the celebration. The energy radiating from Pretoria is palpable as thousands of anxious people fill the steps of the capitol. 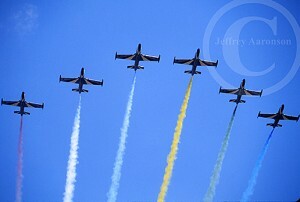 When the roar of M-16 jets flies high above the crowd, spraying the bright colors representing the new flag of South Africa, it signals overwhelming support for the new commander in chief. Never before has a black person in South Africa been treated with such an honor. Jeffrey pauses for a moment to relish this moment, then lifts his camera to capture the flyover, followed by helicopters hovering overhead with the country’s new flag. 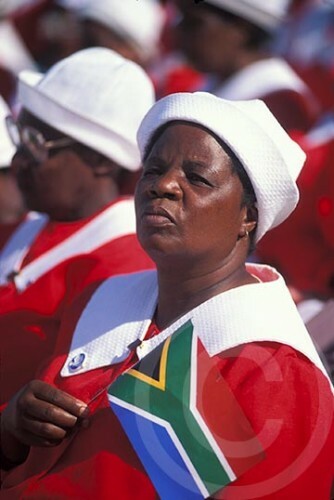 The six colors of the flag, red, green, black, yellow, white, and blue, along with its Y-shape design, are meant to symbolize the convergence of diverse elements within South African society, taking the road ahead in unity. When Nelson Mandela takes the stage to deliver his inaugural address, the crowd erupts into a fever of support. The impossible is happening and the significance is not lost on anyone. As Mandela continues his speech, it is not his words or conciliatory attitude that strike Jeffrey most, but his remarkably open and charismatic personality. He can think of no other person in the world who could possibly bring his country together than him. Note: Portions of this blog post are excerpted from my upcoming book, The Art of an Improbable Life. 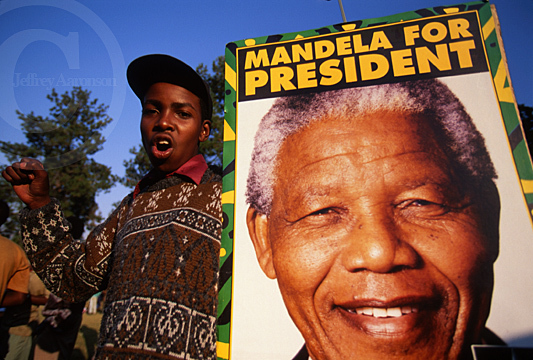 This entry was posted in Photography, Thursday Picture of the Week, Travel and tagged 1994, democracy, end of apartheid, jeffrey aaronson, Nelson Mandela, photography, photojournalism, President Mandela, racial equality, South Africa, South African President by Becky Green Aaronson. Bookmark the permalink. Well done, Becky. I saved this to read when life slowed enough to let the emotions seep in like a soothing cup of tea. I read through my stack of saved newspaper articles from the 6th and wrapped up with your very complete blog post, including every related link. Thank you for such articulate writing! Thank you, Jean. It makes me smile picturing you with a cup of tea while you meandering through my posts. I”m glad you enjoyed them. Thanks for stopping by to let me know you were here! Happy holidays to you! What an amazing experience for Jeffrey! To be an eye witness to such a historical moment! Well written. Reading it, I felt as if I, too, was there. Mr. Nelson Mandela is on of y Heroes, I am glad you shared such a important day with us Becky. That man fought hard to to send a strong message to not only his state or country but to this world. I always wonder how the people of my country must have felt on August 15th 1947, when our country got independence. I believe this important day of history which you have shared with us with this post must be similar to the day we got independence. Becky is this post a part of your book “An Improbable Life”? When are you going to publish it? Nelson Mandela is an inspiration to many people around the world. I think few of us could imagine enduring what he did, and or having his fortitude to conquer apartheid without doing it full of hatred toward his oppressors. I wonder if you will be writing something about August 15, 1947 on your blog? It sounds like there is much to share! And to answer your question, this post does contain excerpts from my book. When am I going to publish it? I continually pressure myself to get this book done and published as soon as possible, but I recently started telling myself that instead of rushing to finish it, I want to take a slower approach to consider the structure a bit more, to re-write sentences and hopefully bring the magic alive. If I’m only going to write this book once, I want to make sure I do it in a way that best tells the story. I will keep you posted as things progress! Your approach is a real good one. There is no need to hurry. You need to bring those experiences of Jeffrey on paper with your words in the best way possible. I am very much sure, Your book will be huge success Becky. From your comment to Lori I assume you’ve also been to South Africa? It is a beautiful country, but there’s too much corruption, greed and violence there right now. Yes, I have been to South Africa. It was right after Mandela was released from prison so much has changed since I was there. Your recent visit, which offers us fresh eyes and experiences, was surely different than mine. Some things will always remain the same though: the beauty of South Africa and the warm hearts of many, despite the corruption, greed and violence of some. Beautiful writing, Becky. The narrative was so detailed and showed the awe and happiness that must have been felt that great day. I’m looking forward to your book! Thank you, Tina. When I was writing this chapter of the book I felt like I was on an wild emotional rollercoaster. There was so much tension and mistrust leading up to this election (which I barely touched on it in this post); it truly was a miracle that it ever took place. 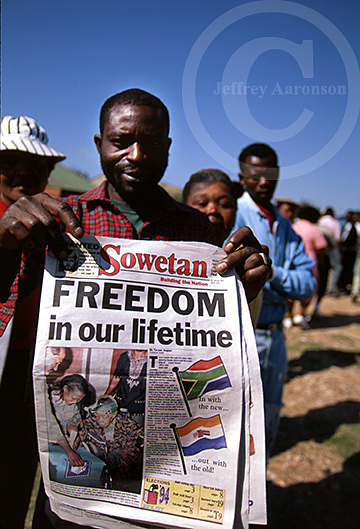 A Newsweek photographer had been killed in Soweto just a few days before Jeffrey arrived. The bomb blast I mentioned happened the day he arrived. Everybody was on edge. When the three days of voting took place without any major violence or missteps, unadulterated relief swept through the country. 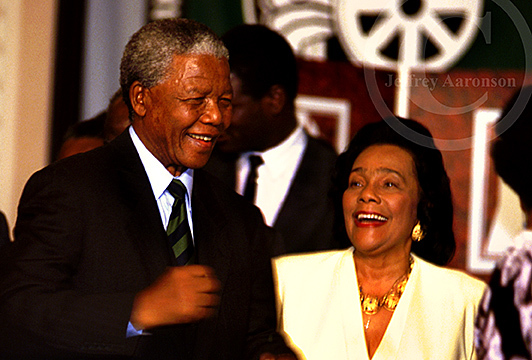 Then utter joy and adulation when Mandela won. It still gives me goosebumps thinking about it. I lived there for 3 1/2 years but left in 1989 because I felt I was supporting apartheid by staying. I love the line in your post: “nothing can prevent the tidal surge for equality already in motion.” I hope one day, in my life time that line will be in a post about what we have achieved for animal rights. I’m sure your experiences in South Africa helped shaped your compassion and your drive to be involved in worthy projects throughout Africa. South Africa and its extraordinary people (and animals) does not leave you once you’ve been there.